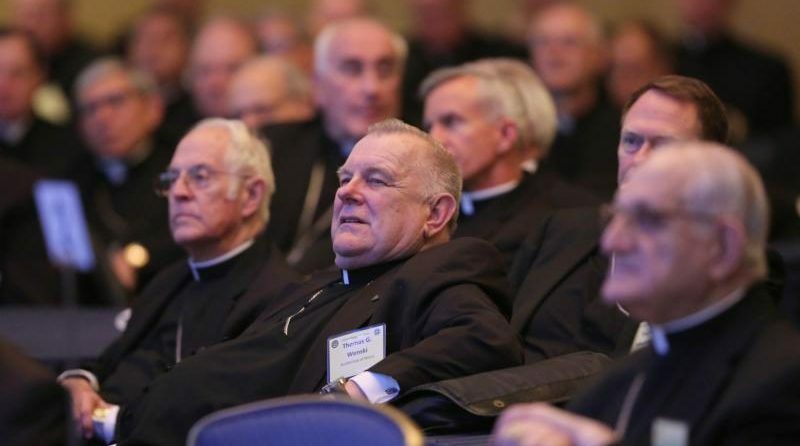 UPDATED – BALTIMORE (CNS) — At the start of their annual fall assembly in Baltimore Nov. 13, U.S. Catholic bishops faced some big issues — immigration and racism — straight on and zeroed in on how to raise the national level of discussion on these topics starting in the church pews. The bishops were keenly aware that their defense of immigrants was not necessarily the view of the U.S. church at large. For example, Chicago Bishop Blase J. Cupich spoke of dangers of Catholics falling prey to and believing “poisoning rhetoric” about immigrants that demonizes them. “There’s something wrong in our churches, where the Gospel is proclaimed, and yet people leave our worship services, our Masses on weekends, with that rhetoric still echoing in their hearts,” he said. Several bishops also brought up the notion of prudential judgment — referring to the view Catholics could take on immigration that differs from the bishops — since it is not a specific matter of church teaching. “We can make America great, but you don’t make America great by making America mean,” he added, referring to a slogan of President Donald Trump without naming him. “Racism isn’t going to be conquered by speech but by actions,” said Archbishop Wilton D. Gregory of Atlanta, adding that this was a watershed moment where the church could play a leadership role. He spoke about discussions happening at diocesan and parish levels, and several bishops commented about them as well noting that these discussions are not easy, but so necessary to bring about healing. Other key issues of the day where church leaders are responding include health care, taxes and abortion, mentioned by Cardinal Daniel N. DiNardo of Galveston-Houston in his first address as USCCB president. He took office at the close of last year’s fall assembly. He explained that the National Catholic War Council, created by the U.S. bishops in 1917 in response to the world refugee crisis that emerged from World War I and the forerunner to the USCCB, was formed to address great national and international needs at a time not unlike today. He told them to be adventurous in the “new frontier of faith” and to make a strong effort to accompany young people who often question their faith. He also urged them to follow the pope’s call to accompany the modern church. Prior to the Mass at the Basilica of the National Shrine of the Assumption of the Blessed Virgin Mary, a few protesters held placards or placed them on the sidewalk, calling on the U.S. bishops to embrace pacifism. Also in the lobby of the hotel where the bishops were meeting, a protester sought dialogue with church leaders to urge them to offer sanctuary to immigrants facing deportation, and another voiced displeasure with church leaders he said support war. They also voted to move forward the sainthood cause of Nicholas W. Black Elk, a 19th-century Lakota catechist who is said to have introduced hundreds of Lakota people to the Catholic faith. As part of the business side of the meeting, the bishops elected Archbishop Allen H. Vigneron of Detroit as the next secretary of the U.S. Conference of Catholic Bishops. He’ll take office next November. Votes also were cast for a new chairman of the bishops’ Committee for Religious Liberty and chairmen-elect for the committees on Communications, Cultural Diversity in the Church, Doctrine, National Collections and Pro-Life Activities. They highlighted past events such as the Convocation of Catholic Leaders in Orlando, Florida, this summer and spoke about tapping into the energy that came from that national gathering at diocesan and parish levels. They also previewed upcoming events such as the U.S. Catholic Church’s Fifth National Encuentro, or “V Encuentro,” next September in Grapevine, Texas, and World Youth Day Jan. 22-27, 2019, in Panama City. The bishops identified key issues they are addressing with Congress, including health care, the federal budget and tax reform, and concluded their assembly by mentioning the impact of recent disasters such as hurricanes and wildfires. Contributing to this story was Rhina Guidos, Dennis Sadowski, Mark Pattison and Julie Asher.